– ¿De qué acusan al Presidente de Guatemala? 10. “…El natalicio y muerte del ex presidente Hugo Chávez Frías fueron incluidos dentro del efemérides escolar, de acuerdo con las resoluciones del Ministerio de Educación publicadas en la Gaceta 40.739 del viernes 4 de septiembre de 2015. According to an internal government report, international reserves plummet 33% in a year. When Venezuela’s president, Nicolas Maduro, announced Tuesday a “new economic offensive” he failed to explain to the country a couple of important truths: there is not enough hard currency to pay for all imports, a rather serious matter considering the fact that Venezuela is significantly dependent on them and that current policy has no way of increasing international reserves due to the reduction of oil and mineral production, such as gold. In its latest weekly economic report, for internal use, Venezuela’s Government admits having a problem with international reserves. As of April 15th, total reserves had fallen to 20,603 million dollars, representing a collapse of 33% compared to the volume registered in early 2013. Throughout the past year the fall has been steep and steady. 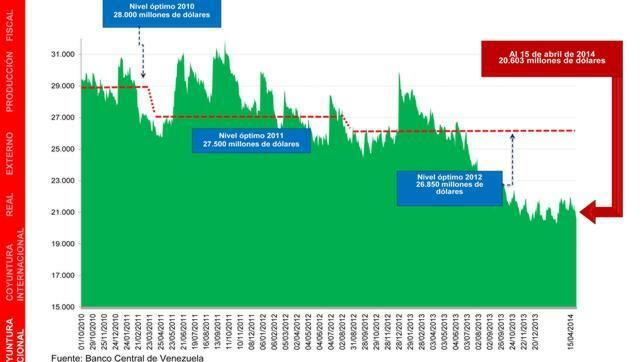 In its gradual decline, reserves pierced ten months of the optimal threshold level indicated by Venezuelan policymakers themselves, which is 26,850 million. The bar was lowered and on previous occasions accompanied by shrinkage of the Venezuelan economy. This was stated on the report by the Ministry of Planning last Wednesday, obtained by ABC. Based on the Ministry’s data, obtained from the Central Bank of Venezuela, experts conclude that liquid reserves could be around $600 million. This is a critical volume for a country the size and condition of Venezuela, with a population of 31 million inhabitants. By crossing data on currencies settled by the Commission of Foreign Exchange Administration or Cadivi, since its creation in 2003, and the volumes of imports in the last ten years, a significant gap is exposed. On the one hand, in 2012 and 2013, years in which the country’s situation began to deteriorate, Cadivi fell short in its hard currency exchange settlement for the cost of imports, resulting in a 4,774 million compounded deficit, a fact that has been accentuated between January and March 2014. Sources in contact with the Venezuelan monetary authorities claim that in the first quarter of this year only 1,200 million dollars have been granted (between Cadivi and its successor Sicad) versus the quarterly average of 12,847 million dollars of last year. Furthermore, in previous years, Cadivi settled a much larger volume than was needed for imports, which is a remarkable irregularity: between 2003 and 2011, where there was a whole liquidation of 74,913 million dollars with an unknown purpose that might have very likely contributed to growing fortunes based on corruption. The behaviour of international reserves corresponds to the decrease in revenues from exports, mainly oil, which in 2013 was 88,962 million dollars, compared to 97,340 in 2012. This is consistent with lower oil production, which in February stood at 2.87 million barrels, according to OPEC figures, to which the Venezuelan government returned since last September, after several years of offering considerably higher self-issued figures. However, the output still seems fictional because the proceeds signal a production of 2.3 million barrels, according to the official price of $101.2 per barrel in 2013. “The figures managed by the Ministry leave a lot to be desired. Simple arithmetic’s indicate that adding what the internal market consumes, what is sold to the United States, what is exported to Cuba and Petro Caribe and what is delivered to China, yields a total of 2.3 million barrels a day,” states oil expert Antonio de la Cruz, Executive Director of Inter American Trends. “An additional 500,000 barrels per day is not something that is happening,” he adds. There has also been a significant decline in mineral production. Gold fell 64.1% between February 2013 and February 2014 (last month being 97 kilos of gold extracted, versus 700 kilos reached on several months in 2010). Also significant was the reduction of iron production, with sales dropping 49.8%. Car sales dropped 86.1% last year. According to the report issued by the Ministry of Planning, in February of this year, the accumulated inflation was 5.8% and the annualized inflation stood at 57.3%. Astonishingly, March’s data was not included. It would have revealed a situation of further deterioration. The shortage of products in February was 29.4% through the official distribution networks. Source: Blasco, Emili J. “Venezuela se queda sin suficientes divisas para pagar las importaciones”. ABC.es. 23/04/2014. Diario ABC, S.L. 23/04/2014.